If you have been injured in accident, you may be wondering about the ins and outs of the procedure. Maybe you want to know how complicated the process is. Maybe you want to know how much you can get for your New Jersey personal injury case. Or perhaps you want to know how long the case procedure will take. 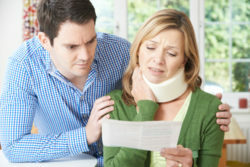 All of these are very common questions asked by personal injury victims. We are here to help explain the injury case system and clear up any confusion. Although it might be stressful at the beginning, as it is an unexplored area for you, the compensation system in place for personal injuries and figuring out a fair compensation amount isn’t that difficult. There are usually just some simple factors you need to consider. These include the type of accident that occurred, your injuries and their severity, and the medical costs and other costs incurred due to those injuries. Although insurance companies tend to offer much lower than what you actually could get, this doesn’t mean you have to take it. That is where your real fight will begin. Statistics show having an attorney help you with your personal injury case can help you get up to three to four times the settlement amount you could get on your own. The expertise of attorneys like Richard A. Stoloff can help them to find loopholes or uncover crucial evidence you may have not been able to find or even consider on your own. There are limitations to how much you can receive for your personal injury case. In most cases, the defendant’s insurance policy and those limits will define your settlement offers. Of course with a quality lawyer, there are ways around this to serve justice fully. When someone does not have insurance and does not have a lot of money or assets, there is also only so much you can take from them. Another limit can be your injuries. If you have some limitation to your wrist movements, that is nowhere near as severe as becoming a quadriplegic. Different injuries, their severity, where on your body you were hurt, and the level of disability (temporary or permanent) will all factor into the maximum settlement you can receive. Settlement length times really depend on how complicated your individual case is. If there are a lot of details to hash out regarding the accident, if there are people that you are having difficult getting into contact with, or if there is a lot of evidence that takes time to gather, these can lengthen your case time. It is also usually a good idea to have your injuries treated to the best extent, so you can properly calculate the full costs of your injuries. In general, the settlement process can take anywhere from seven months to a year. Studies show that taking a bit more time to plan and gather evidence, however, is more likely to result in an optimal settlement outcome. This is estimated to be about ten months. Did you or a loved one sustain serious injuries due to a motor vehicle accident or slip and fall in New Jersey? Don’t let the medical bills pile up while you wait for the negligent party or their insurance company to do the right thing. Right now, you need an aggressive personal injury attorney on your side, fighting to get you the compensation you need, want, and deserve. The skilled attorneys at The Law Offices of Richard A. Stoloff represent clients injured because of a slip and fall or truck accident in Egg Harbor, Atlantic City, Hamilton, Hammonton and throughout NJ. Call (609) 601-2233 or email us to schedule a free consultation about your case. We have an office conveniently located at 605 New Road, 1st Floor, Linwood, NJ 08221, as well as an office in Philadelphia, PA.